You wouldn’t think we need permission from total strangers, friends and extended family to grieve but many times it feels like we do. Odd looks, questioning stares and wagging tongues can make a heart doubt whether it’s really OK to do this or that while trying not to fall apart. Well I’m here to tell you-ignore all that! You have permission to do whatever it takes to endure this journey as long as you are not harming yourself or others. I have all kinds of little things I do to help my heart hold on. Some of them are quite public and others only I know about. Either way, it’s no one’s business but mine. I do try not to make other people uncomfortable but I draw the line at the place my sanity outweighs their discomfort. I won’t apologize for utilizing whatever supports keep me keeping on and not giving up. So if you are worrying more about what other people think than what helps your heart, PLEASE STOP! You are free to be who you have to be. You are free to do what you have to do. 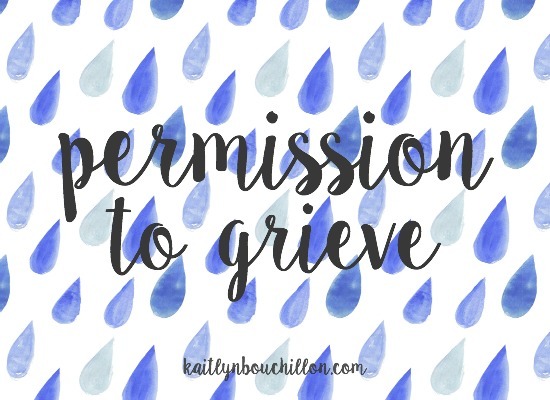 You don’t need anyone’s permission to grieve. You are absolutely right! Sometimes we feel bad for making other uncomfortable by our tears and sorrow but often times we need to get those emotions out to fully grieve. When my grandmother passed away I remember doing all I could to prevent myself from crying when that’s what I NEEDED to do. I have hope that we all will see our loved ones again in Paradise (Luke 23:43) and we’ll be able to hug them and love them again when their names are called to rise again (John 5:28,29;Revelation 21:3,4). Until then we all most do whatever it takes to get through the grieving process. This reminds me that I need to help others by supporting them during this process as well. Thank you! and ended in disbelief and grief. I find myself examining each day of this two week period looking for clues that I may have missed. I know it’s counter productive but I can’t seem to stop myself. In many ways her last two weeks on this Earth ranged from disappointment then great joy to emotionally devastating. I’ve been piecing together all I’ve learned and now believe she overdosed on Fentanyl but I don’t think she intended the result she achieved. She had made pleas for help in the past by taking just enough of whatever to make her ill but not cause and permanent damage. She was just in so much emotional pain near the end that she just wanted to stop hurting. My greatest hope is during her last couple of hours while the Drs in the ER were working on her that she reconciled with God. This is hard but I’m trying to understand. Linda…I understand your journey through this grief. My son…my little buddy (later to be my big buddy bc he had grown to 6’7” tall) who was also by my side when I wasn’t working or something necessary. He was my joy in life. I just wish that we could recover that period of time before their death, so that, at the very least, we understand what & why the cause of our grief occurred. I’d love to have the opportunity to spend that fragment if time, trying to change the outcome of what happened in our loved one’s life. I’d trade places with him in a heart beat bc life just isn’t the same anymore. Next Next post: Repost: No Mirrors, Please!